How to Play the Trumpet. Playing the trumpet is a combination of how you move air through the instrument, the way you form your mouth and how you buzz your lips. By varying these skills along and mastering your valve combinations, you learn to control the sounds that come from your trumpet. Keep your air flow constant. The air flow is responsible for the music you make, so learning to control your breath is essential to playing well. Produce low notes by forming your mouth as you would when you say a short "a." Shape your mouth as you do when you say a long "e" to produce high notes. Practice with the mouthpiece alone to perfect your air movement and lip buzzing, as this helps you focus on technique. The faster you buzz your lips, the higher the pitch you'll achieve. Increase your buzzing by pressing your lips together harder. Use your tongue to quickly disrupt the air flow to create a separation between notes or to create vibrato. Slur to shift from one note to another. When properly done, slurring is seamless way to go from one note to the next so that the listener doesn't know when one ends and the other begins. Learn the valve combinations, then practice them until your fingers instinctively reach for the right valves. 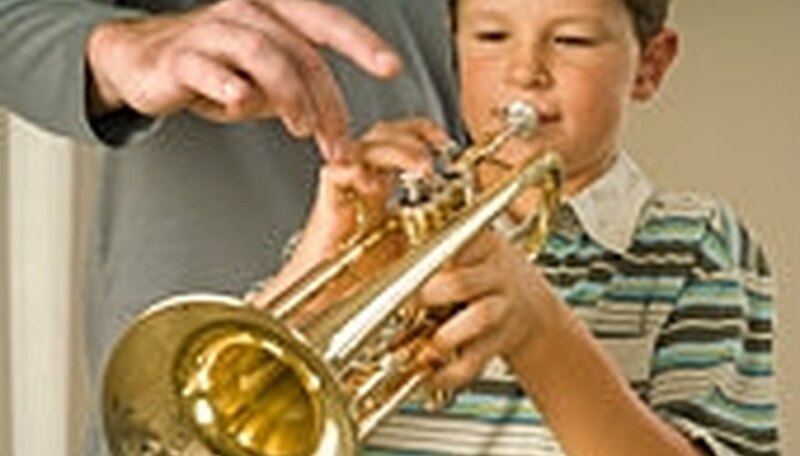 Beginning trumpet players may want to practice several times a day rather than in long segments of time, since different muscles need to be used to play the trumpet. Strengthening those muscles is critical learning the trumpet.